Great for growing a thick, beautiful lawn in either sunny or shady areas, this grass seed mix germinates quickly so you can enjoy your lawn sooner. Consists of a hardy mix of grass seed. Available in a variety of sizes. Fast Grow Grass Seed has different options and/or variations, please choose below. 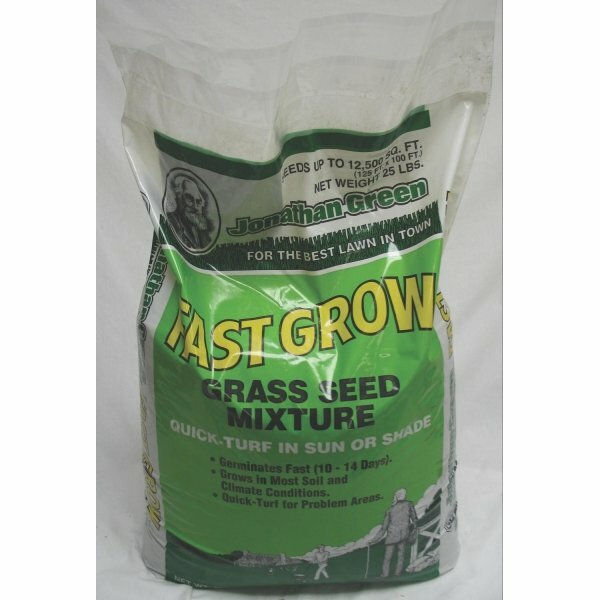 The Fast Grow Grass Seed by Jonathan Green is perfect for growing a beautiful lawn quickly. Seed takes hold in 7 to 14 days and is formulaed to grow in both sunny and shady areas. Ideal for a variety of yards and made to be hardy. 15-lb. - 7,500 sq. ft. Provides a hardy turf quickly in sun and shade. The perfect seed mixture where the fastest results are required. Germinates in just 7 to 14 days.60% Annual Ryegrass, 20% Perennial Ryegrass, 10% Kentucky Bluegrass, 10% Creeping Red Fescue.